Found on one of the less busy shopping arcades just west of Asakusa's Sensoji, this otherwise nondescript ramen-ya's only real selling point is that it's 100-percent halal, approved by experts from the Masjid (mosque) in Otsuka. 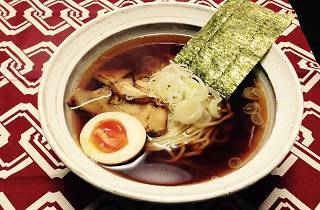 Their menu consists of ramen, maze-soba (noodles without soup), zaru ramen (cold noodles) and a variety of side options, all either beef- or chicken-based. The place itself is very, very small, and the prayer space upstairs could merely fit a single, very small person, with only minor comfort and cleanliness in mind. If you're looking for a real Japanese ramen experience that satisfies in both the taste and atmosphere departments but is halal, we'd highly recommend heading elsewhere.